Obama’s solution to the fiscal catastrophe that lies ahead is to raise taxes on the rich. That doesn’t even begin to fix the problem. According to the Obama’s own Treasury Department, the tax increases he is advocating would generate $85 billion in new revenue next year. By comparison, the total deficit for fiscal year 2012 was roughly $1.1 trillion. In other words, the proposed tax hikes would still leave us with a trillion-dollar deficit. 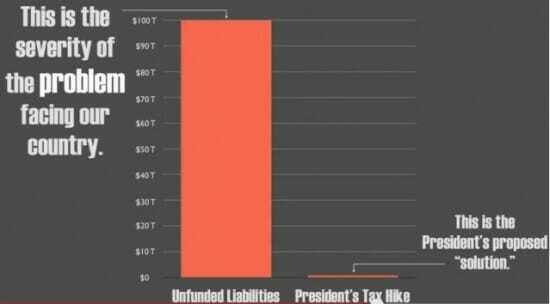 And his tax hikes do nothing to solve the fiscal cliff of unfunded liabilities. President Obama knows his plan is not a solution. And the media is complicit in this lie. It’s time to call them out. Obama was permitted by the media to claim, or at least strongly imply, that the painful cuts Romney was talking about (and Obama, the Great Leader, was not talking about) could be averted simply by levying a small tax on the “richest 1% .” It was a lie. It was further a lie the media assisted in. All those Fact Checks and not a single column noting that the central pillar of Barack Obama’s Re-Election Strategy was a baldfaced lie that only the uninformed or innumerate could possibly believe. The media is strongly complicit in this lie. If I were someone in power, I would make this connection vigorously, and lay the blame at the feet of the media, and inform the public the media lied to them, and if they’re about to get a unwelcome shock, they should write to ABC, CNN, NBC, and the rest of the clownshow and ask them why they chose not to report the actual numbers. At any rate, the public does believe this (and why shouldn’t they? The President told them the only fix that was needed was a tax hike on the rich and the media vouched for him). Time to strip them of that misapprehension and force them to confront the actual choice. Jim Geraghty has more thoughts.